In a series of scientific presentations held today (March 18) at the 50th Lunar and Planetary Science Conference, mission scientists shared new data about the space rock's topography and composition, which is helping them to refine scenarios about how the object formed. "Every single observation that we planned worked as planned," Alan Stern, principal investigator of the New Horizons mission and a planetary scientist at the Southwest Research Institute, said during the team's first presentation. "We had a 100 percent successful flyby." The wealth of data the spacecraft was able to gather has offered mysteries and hypotheses alike about the distant Kuiper Belt object, which scientists hadn't even discovered when New Horizons launched. In particular, the team has been eager to piece together how the object, which is formally known as 2014 MU69, formed. Soon after the flyby, the team confirmed that MU69 is in fact two objects stuck together in what scientists call a contact binary. 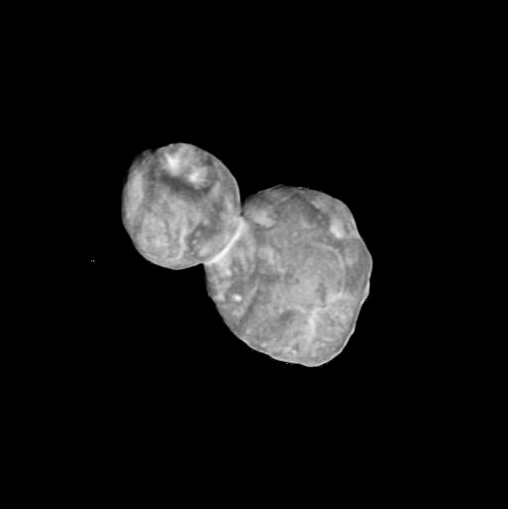 Continuing analysis of high-resolution black-and-white New Horizons photographs suggests that the two halves of the object formed separately, and that the larger lobe, nicknamed Ultima, appears to be the result of many much smaller objects clumping together, like Dippin' Dots. A new map produced by the New Horizons team appears to show the many different lumps of rock that converged to form the object nicknamed Ultima Thule. But when the team turns to color images, it's harder to see evidence of this aggregate structure. MU69's overwhelmingly red surface shows some variations in color that match surface features, but not the hypothesized small geologic subunits. "You definitely see some correlation with the geological features, but one thing that you don't see is any logical correlations with these lumps which might be previous stages of accretion," Will Grundy, an astronomer at Lowell Observatory in Flagstaff, said during his presentation. "They don't look obviously different from each other." The new findings also touch on how the two pieces of MU69 converged. As the team has gotten a closer look at the joint of the object, they haven't found any signs that a violent collision distorted the rock. Instead, the scientists believe that the two halves of the object formed separately, hung around together long enough to sync up their longest and shortest dimensions — like two neighboring pancakes — then very slowly touched, at a speed of about 9.8 feet (3 meters) per second. "You can do this yourself, you can walk into a wall," William McKinnon, a New Horizons partner and a planetary scientist at the Washington University in St. Louis, said during his presentation. "It's a very gentle situation." Although the spacecraft's stay at MU69 was incredibly brief, mission scientists will be receiving new data from New Horizons for more than a year. That's thanks to the amount of observations it was able to make and the slow data-relay rate possible for the probe at such a long distance from Earth. The combination means scientists will be grappling with puzzles about the object for quite a while to come. 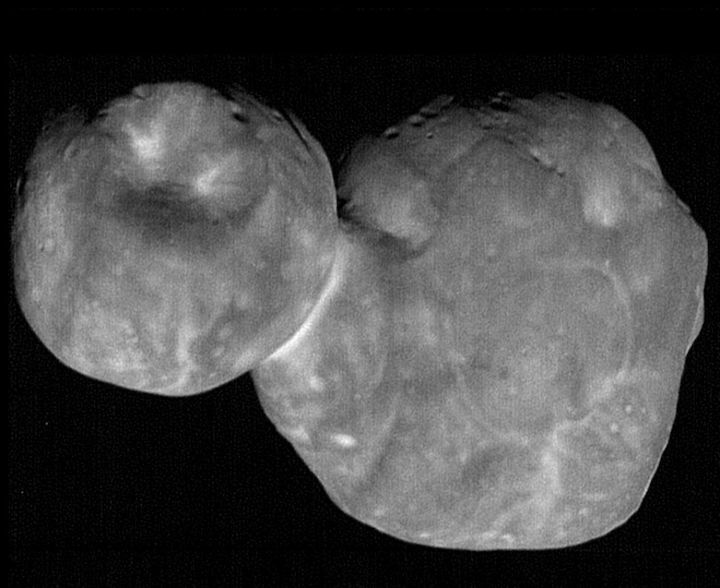 "Ultima Thule is beyond remarkable," Stern said. "It has presented us with a wide variety of mysteries, and frankly, I think on a per-gram basis, it may even be outdoing Pluto itself. THE WOODLANDS, TEXAS—As data streamed down last month from NASA’s New Year’s flyby of MU69, the most distant planetary object ever explored (above), New Horizons mission scientists got a shock. Rather than the 35-kilometer-long space “snowman” they were expecting, angled images revealed a flatter—not fatter—version, like two lumpy pancakes smooshed together. Because the two lobes aren’t spheres, their height, width, and depth can be seen as three distinct axes, and all three axes of the lobes are nearly perfectly aligned, as if they had been laid end-on-end like dominos. This type of alignment would be expected if the duo formerly orbited each other in close proximity, their gravity gently tugging back and forth. “It’s very improbable this would arise completely by chance,” McKinnon says. Findings from New Horizons continue to shed light on the Kuiper Belt Object. Richard A Lovett reports. An image of Ultima Thule taken by New Horizons on New Year’s Day, 2019. Details about the bizarre shape of a worldlet known as Ultima Thule, 6.5 billion kilometres away, are producing a breakthrough in understanding how the solar system formed, scientists say. When NASA’s New Horizons spacecraft flew by on 1 January 2019, its first views of the Kuiper Belt Object revealed something that looked like a snowman, composed of two lobes, connected by a narrow neck. But as later views showed it from different angles, scientists realised that the two “balls” making up the snowman weren’t spheres, but were flattened and elongated – more like deformed biscuits or hamburgers than meatballs. Now researchers say that it appears that they are also very precisely lined up with each other. “The two lobes have axes: a long axis, a short axis and an intermediate axis,” says William McKinnon of the Washington University in St Louis, US. The researcher presented his findings at the fiftieth annual Lunar and Planetary Science Conference, held this week at The Woodlands, Texas. This unusual alignment, he says, is an indication that the two bodies that merged to create Ultima Thule didn’t collide randomly. Other evidence shows that when the two objects merged, they did so very gently. “You don’t see signs of violence or stress fractures,” says Alan Stern from the Southwest Research Institute (SWRI) in Boulder, Colorado, the New Horizons principal investigator. McKinnon adds that the collision probably occurred at a gentle two metres per second – roughly the speed of a brisk walk. All of this, he adds, lends support to a model of planet formation in which the building blocks formed from the gravitational collapse clusters of pebble-sized particles, rather than from things crashing into each other, randomly. 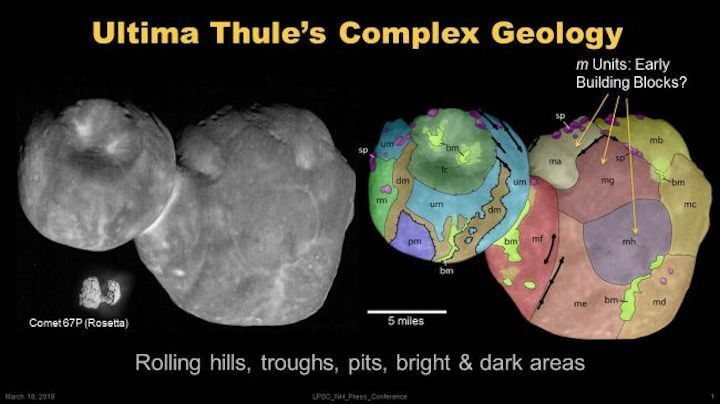 “The evidence we have from Ultima Thule fits with this picture and not the other,” McKinnon says. Meanwhile, other scientists are studying other aspects of the worldlet, looking to find additional clues to its history. Colour images, for example, show that it is very red. Most likely, says Carly Howett, also of the SWRI, this is caused by the effect of billions of years of sunlight on organic materials on its surface, in a process that slowly converts them into a class of compounds sometimes called tholins. “The colouring is consistent with the idea that we’re looking at a primordial object,” she says. Her SWRI colleague, Silvia Protopapa, adds that other spectroscopic features indicate that there is also water and methanol. That latter, she says, is also indicative of Ultima Thule’s primordial nature. “It’s in comets and around protostars,” she says. Other details are emerging about the object’s surface geology. It has at least one large crater that appears to be an impact crater, plus a chain of pit craters that might be from subsidence into a subterranean crack, says Kirby Runyon, a postdoctoral researcher at Johns Hopkins Applied Physics Laboratory in the US. There may also be sublimation pits, formed when super-volatile compounds such as carbon monoxide burst out from below ground, leaving crater-like indentations on the surface. There are also rolling hills, lumps, troughs, and even signs of avalanches. “Even though the gravity is only 1/100,000 that of Earth, things still fall downhill,” Runyon points out. In addition, the neck between the two lobes appears to be bent to one side. “That may be indicative of how those two lobes slowly collided,” Runyon says. Stern adds that a lot more data is yet to come. “Most of the data from the flyby is still on the spacecraft,” he says. Once the rest of the data is returned, sometime in late summer of 2020, he says, New Horizons will continue to study the interplanetary medium in the Kuiper Belt and to turn its onboard telescope onto whatever other Kuiper Belt objects happen to be close enough to be visible. But it also has still has manoeuvering fuel, offering the prospect of another pass. “We have more fuel on board than it took us to target this flyby,” Stern says. 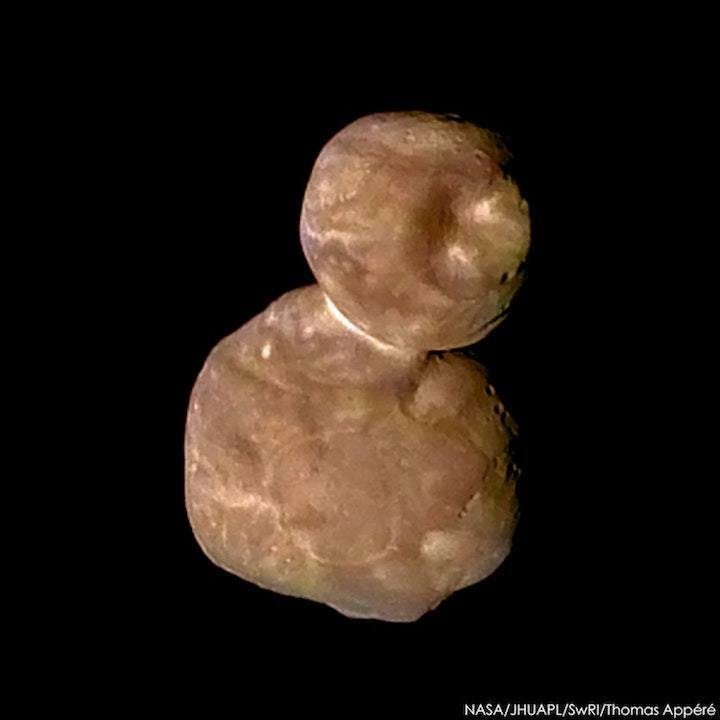 There’s just one problem: it was hard enough to spot Ultima Thule from Earth, so that the spacecraft could be directed toward it. “[And] as we get father and farther out, the objects are fainter and fainter as seen from Earth,” Stern explains. Most likely, he says, New Horizons will have to search for its next target using its own telescope – hoping that it spots something in time to reach it with its remaining fuel.